Ventus, Latin for “wind”, expresses the essence of Larson’s vision and artistic approach in creating music that soars beyond industry labels or genre boundaries. Rhonda plays a variety of ethnic flutes from around the world, writes her own music, and has arranged others from ethnic and folk traditions. This includes Celtic, middle-eastern, Native American, sacred chant, and medieval music, to name a few. It is a celebration of the shared experiences of the human spirit, and is accessible to audiences of all ages. Born and raised in the mountains of the ‘Big Sky’ country of Montana. Montana instilled the essence of who Rhonda is as a performing musician: a nature-loving, trail-blazing ‘wild west’ spirit and a mountain-top perspective as to creative possibilites. 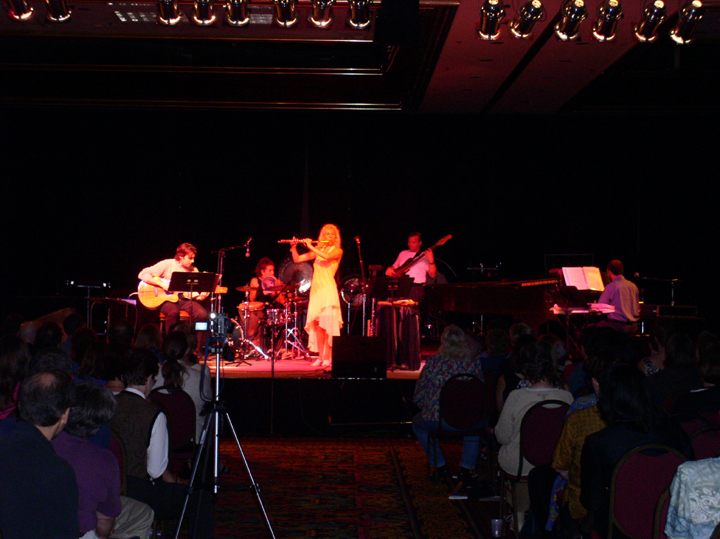 Rhonda entered the national music scene by winning first prize in the National Flute Association’s Young Artist Competition at the age of 22, including a Carnegie Recital Hall debut. 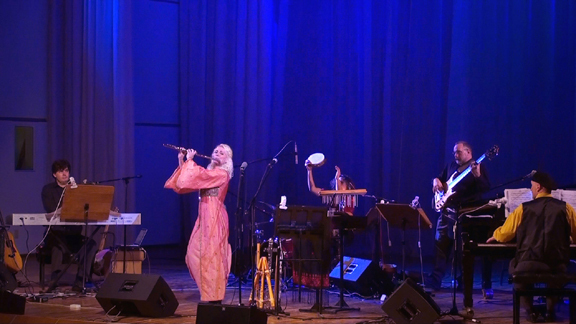 Shortly thereafter, Rhonda was invited to join forces with the Paul Winter Consort, initiating her journey into a rich palette of music gleaned from around the world. 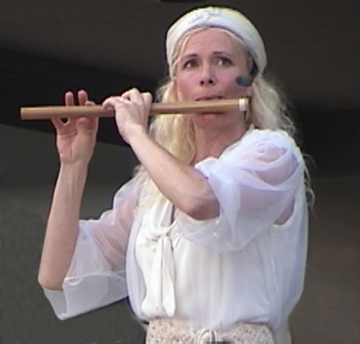 Rhonda has also expanded the sonic capabilities of her instrument with entirely new techniques, most notably her inventive singing and playing flute simultaneously. Rhonda owns and operates her own publishing company, Wood Nymph Music, and has a discography of over 20 commercial recordings, including her solo recordings, Free as a Bird, and Distant Mirrors, and most recently, Live from China with her band, Ventus. She performed on a live CBS finale episode of “Survivor” from Madison Square Garden’s, seen by over 40 million viewers, and is featured in “Flute Stories–101 Inspirational Stories from the World’s Best Flute Players” publication. 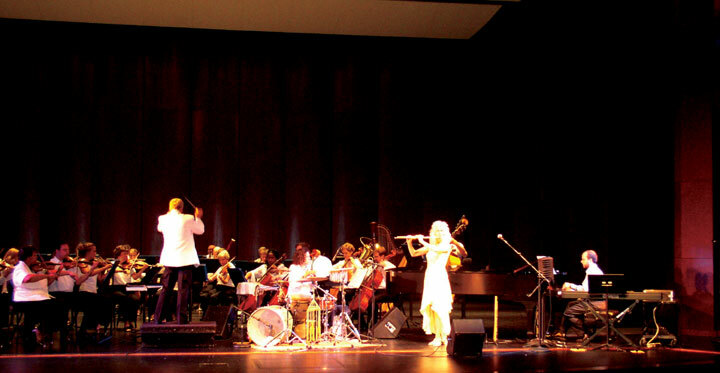 Ms. Larson tours world-wide as both a soloist and leading Ventus. Rhonda and her husband Lee live in Southwestern Connecticut, and part-time at their home in the Lazio region of Italy. When not playing the flute, Rhonda can be found out-doors. Rhonda Larson & Ventus frequently perform under the auspices of the US Embassy—a natural fit for Larson, given that her forte is the use of music as a diplomatic medium in addressing conditions of the human soul common to all peoples.